Las Olas condominium community in Jacksonville Beach, Florida. Get Feng Shui tips, Jacksonville Florida real estate, MLS listings, homes for sale, pre-construction homes, condominiums and relocation information. Search for new condominiums, townhomes, vacation homes and request relocation information to Jacksonville, Florida from from Will Vasana, REALTOR®. 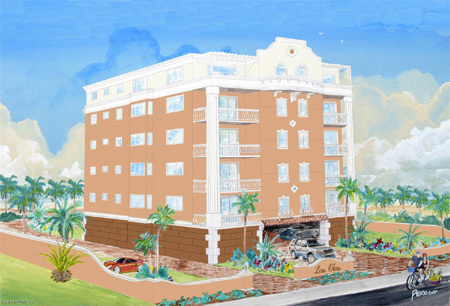 Las Olas is a new 6-story condominium building in Jacksonville Beach. Located across from the Atlantic Ocean, Las Olas offers three bedroom three bathroom floor plans from the $830's. Featuring pre-cast masonry construction, building elevator, trash chute, one garage parking under building and one parking space for each residence. Enjoy the Beach lifestyle of fun, sun, ocean breezes, and the sound of crashing waves. Close to all that the Jacksonville Beaches have to offer, you'll never want to live anywhere else. For a private tour and showing, please call (904) 307-8998.